Today is Mothers Day. Some people honor their mothers. Some people cherish their mothers. Others just tolerate their mothers, and some have outright hatred for their mothers. However, in general, the normal loving family is, well, boring. You want interest, bring on the dysfunction. Bring on the obsessions. Bring on the hatreds. The entertainment industry knows this. When was the last time you saw a completely normal functional family on television? The Waltons, perhaps? Similarly, in the theatre, we like to watch dysfunctional families. They are at the heart of many of the best comedies (including quite a few we’ve seen recently, such as “Vanya and Sonia and Masha and Spike“, “God of Carnage“, and many more. But the disfunctional family is nothing new. 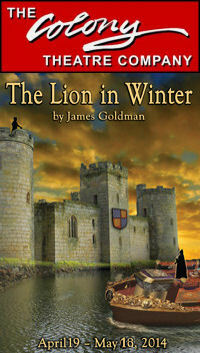 James Goldman‘s 1966 play, “The Lion in Winter” (currently at the Colony Theatre in Burbank) is about one such family. “The Lion in Winter” tells the story of King Henry II and the Christmas Court in Chinon in 1183. Henry has released his queen, Eleanor of Aquataine, from her imprisonment for the holidays. The story focuses on the battle between Henry, Eleanor, and their three sons — Richard the Lionhearted, Geoffrey, and John — for who will be the next King of England. Henry wants John, a foolish young man to succeed him; Eleanor wants Richard, and Geoffrey… just wants to be noticed. Added into the mix is Alais, the King’s mistress and fiancee of Richard, and Philip, the young King of France, who wants the marriage to take place immediately. The play centers around all the sniping and intrigue that goes along with such succession battles — especially battles where each of the principals has a love/hate relationship with each of the other principals, and each has the rhetorical dagger at the ready to slash at those who are currently not favored. This is a play whose story is loaded with humorous dialogue, fury, history, anger and betrayal… but ultimately leaves one with an empty feeling. Although the performances are glorious, one wonders at the end what growth has occurred in the characters. Henry certainly hasn’t grown — his feelings for Eleanor haven’t changed and she is going back to prison. He is more disillusioned in his sons than before, but still realizes that he will need to choose whichever is the lesser of the evils. The sons themselves haven’t changed from their stereotypes: Richard is still quick to make war; Geoffrey is still the schemer; and John is still the fool. Eleanor hasn’t changed: she still wants her son Richard on the throne, and is reconciled to a continual battle with Henry. Alais is still the mistress, but recognizes her role as pawn. Perhaps Philip is the only one who has matured. With no ultimate character growth, and no clear point to be made, this is 2½ hours of witty dialogue, signifying very little other than the chance for some great actors to have fun with the words. Have fun they do. In the lead positions are two strong players, Ian Buchanan (FB) as Henry II and Mariette Hartley as Eleanor of Aquataine. These two come off as appropriately regal, and have an excellent way of using the nuance of phrasing to bring out the knives. Their sparring is fun to watch. This should be no surprise: Hartley is a master at witty repartee given the right foil, and Buchanan serves well in this stead. The younger contingent are no slouches either. Henry and Eleanor’s sons are played by Brendan Ford (Richard), Doug Plaut (FB) (John), and Paul Turbiak (FB) (Geoffrey). Each portrays each brother with the broad brush required by the story: Richard as the brash warrior who thirsts to be king; John as the foolish young man who delights in teasing others that he is Henry’s chosen to be king; and Geoffrey as the schemer behind the scenes who really just wants to be noticed for his talents. They are all played well. As Alais, Justine Hartley (FB) (Mariette’s daughter) plays well off of Buchanan and her mother; her interactions with the others are more limited. Perhaps the most interesting portrayal is Paul David Story as Philip. Story captures the young French king well — initially seeming naive in his youth, but hiding quite a bit of inner strength that comes out later in the story. In non-speaking roles are Desa Julia Ilic (FB), Shannon O’Hara/FB, and Nick Vogels/FB as the castle servants. It was a surprise and delight to see Shannon on the stage — we’ve known her for quite a few years. Shannon is the younger sister of one of our daughter’s good friends. She’s currently at LACHSA, and it was just wonderful to see her on the stage. We waited afterwards to talk to her — the director was one of her high school teachers and chose her for this production, and she’s earning points towards an equity card from this. This is one of the benefits of Colony and how they treat their actors, and we’re glad that Shannon is getting this career boost. The production was directed by Stephanie Vlahos, who kept the story moving alone. As I’ve said many times, in a good production it is difficult to see where the direction ends and the actor begins; that was the case here. The scenic design by David Potts was a suitably drafty and old castle, with the requisite tapestries to hide behind, the stone blocks, the candles, and such. Costume design was by Kate Bergh and seemed appropriate for the character; whether they were appropriate for the period was harder to judge, but hey, this is theatre. Jared A. Sayeg (FB) did the lighting with the usual high quality, and Drew Dalzell (FB)’s sound design provided the appropriate sound effects and music. Properties were by John McElveney (FB). Dale Alan Cooke (FB) was the stage manager. “The Lion in Winter” plays for one more weekend (i.e., until May 18). It’s a fun show if you like to watch dysfunctional families in history. Tickets are available through the Colony Box Office; discount tickets may be available through Goldstar or LA Stage Tix. The Colony Theatre is also having a Costume and Prop Sale the weekend of May 30; this also includes some signed posters by Ray Bradbury for The Martian Chronicles. The Colony Theatre has also announced the 2014-2015 season. The season consists of 5 shows: (♦) “Family Planning” by Michelle Kholos Brooks (July 12-August 10, 2014), a comedy about putting a lot of relatives in the same space (stated as a World Premiere, although it was done by PRT in 2012); (♦) “What I Learned in Paris” by Pearl Cleage, a comedy about lovers in Atlanta in 1973 (West Coast Premiere); (♦) “Handle With Care” by Jason Odell Williams, a story about “love, fate, and the importance of GPS-enabled tracking devices” (West Coast Premiere); (♦) “The Road to Appomattox” by Catherine Bush, a drama about Lee’s final retreat to Appomattox (West Coast Premiere), and “Words by: Ira Gershwin & The Great American Songbook” by Joseph Vass (lyrics by Ira Gershwin, Music by Harold Arlen, Vernon Duke, Jerome Kern, Kurt Weill, and George Gershwin), a jukebox musical about Ira Gershwin (Los Angeles Premiere). Subscription prices run around $175 for the set of shows (at least for where we sit on a Saturday night). Subscription information for the season is here. Upcoming Theatre and Concerts: Next weekend brings both “Porgy and Bess” at the Ahmanson and “Cat on a Hot Tin Roof” at REP East (FB). The next weekend brings the musical “Lil Abner” at LA City College (directed by Bruce Kimmel, with choreography by Kay Cole). The last weekend of May is currently unscheduled: Karen is helping Erin move, and there’s not that much calling to me from Goldstar. June is busy. It starts with a CDF Conference for Karen while I see “The Fantastiks” at Good People Theatre (FB). We lose the following weekend to a Bat Mitzvah. The remainder of the month brings “Stoneface: The Rise and Fall of Buster Keaton” at the Pasadena Playhouse (FB) on June 22, and “I’m Not Just a Comic Genius” at Secret Rose (FB) on June 27. July will be busy: “Ghost” at the Pantages (FB) on 7/5, “Return to the Forbidden Planet” at REP East (FB) the weekend of 7/12, “Once” at the Pantages (FB) on 7/19, “Bye Bye Birdie” at Cabrillo Music Theatre (FB) on 7/26, and “Family Planning” at The Colony Theatre (FB) on 8/2. August then remains quiet as we work around vacations and such, but things start to get busy again in September and October. More on that later. As always, I’m keeping my eyes open for interesting productions mentioned on sites such as Bitter-Lemons, and Musicals in LA, as well as productions I see on Goldstar, LA Stage Tix, Plays411.